"I can create a parallel reality for you, with other Laura's and other Sandro's." This looks like a very fun sci-fi indie. Below is the official trailer for a time travel sci-fi, romantic comedy film titled Melocotones, which translates to Peaches in Spanish, made/set in the Dominican Republic. The film also used the title Mr. Emmett & The Canned Peaches during production, though Peaches is much simpler. This sci-fi features some lo-fi tech and filmmaking tricks to make it feel more unique, including an appearance by an old 5¼-inch floppy drive. Peaches is about a guy named Diego who uses a time travel machine to try and save his relationship with his girlfriend Laura, but things get even worse when her ex shows up. The cast includes Peter Vives as Diego, Joaquín Ferreira as Sandro, María Guinea as Laura, with Frank Perozo and Ramón Langa. This really looks very cool, something about it just seems like the perfect amount of quirky. Somewhere in the Caribbean, in a future that never was: Diego and Laura go out on a weekend getaway in the hopes of rekindling their relationship. Upon their arrival, they soon find their motel completely abandoned. Not one to easily give up, Diego attempts to win Laura's affections. He fails continuously and the arrival of Sandro, Laura's ex boyfriend, obliterates Diego's chances at a reconciliation completely. Diego will find himself reliving his failure over and over and will try any means necessary to succeed at winning Laura back: even if it means competing with different versions of himself when traveling through time. 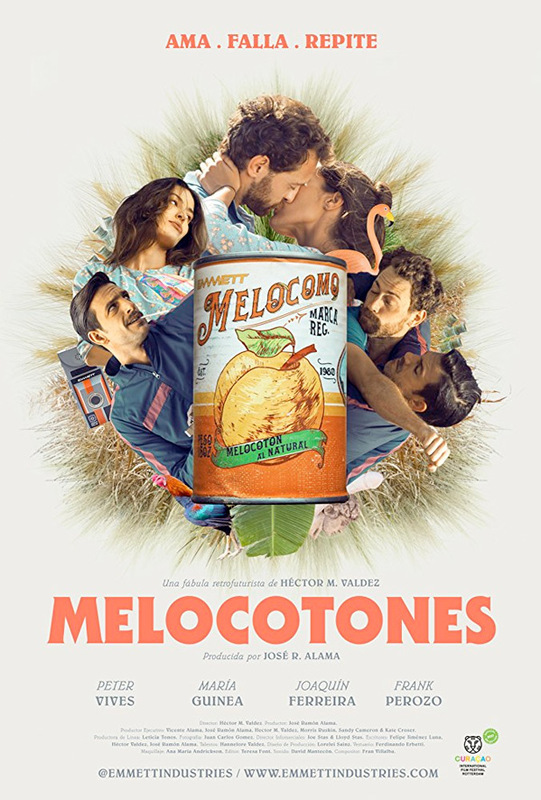 Melocotones, or Peaches, is directed by Dominican filmmaker Héctor Valdez, of the film Al Sur de la Inocencia previously, as well as a few short films. The screenplay is written by Jose Ramon Alama, Felipe Jiménez Luna, and Héctor Valdez; based on "The Infinite Man" by Hugh Sullivan. This first premiered at Raindance Film Festival last year. No official US release date is set yet. Stay tuned for more. Who's into this?